What Is the Fourth of July? I want to share one of my favorite readings on the founding of our country. It was offered and originally delivered by Rush Limbaugh, Jr. – father of current talk radio host Rush Limbaugh, III (Congrads on the new contract!). These men knew what they risked. The penalty for treason was death by hanging. And remember: a great British fleet was already at anchor in New York Harbor. They were sober men. There were no dreamy-eyed intellectuals or draft card burners here. They were far from hot-eyed fanatics, yammering for an explosion. They simply asked for the status quo. It was change they resisted. It was equality with the mother country they desired. It was taxation with representation they sought. They were all conservatives, yet they rebelled. It was principle, not property, that had brought these men to Philadelphia. Two of them became presidents of the United States. Seven of them became state governors. One died in office as vice president of the United States. Several would go on to be U.S. Senators…. 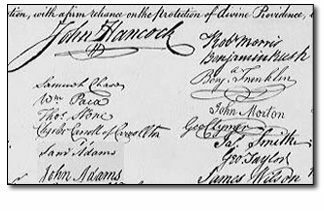 Of those 56 who signed the Declaration of Independence, nine died of wounds or hardships during the war. Five were captured and imprisoned, in each case with brutal treatment. Several lost wives, sons or entire families. One lost his 13 children. Two wives were brutally treated. All were at one time or another the victims of manhunts and driven from their homes. Twelve signers had their homes completely burned. Seventeen lost everything they owned. Yet not one defected or went back on his pledged word. Their honor, and the nation they sacrificed so much to create is still intact. He gave two sons to the officer corps in the Revolutionary Army. They were captured and sent to that infamous British prison hulk afloat in New York Harbor known as the hell ship “Jersey,” where 11,000 American captives were to die. The younger Clarks were treated with a special brutality because of their father. For the complete speech, click here or here. Tagged with Declaration of Independence, Founding Fathers, Founding of United States, Fourth of July, Patriotism, Rush Limbaugh Jr.
Fireworks somehow just don’t seem as fun now. I have another one for you….check out “What to the slave is the fourth of July?” by Fredrick Douglass. Classic speech in American patriotic history. I’m a huge Fredrick Douglas fan. Thanks for making the connection on his speech. I’ll post something on it in the near future.